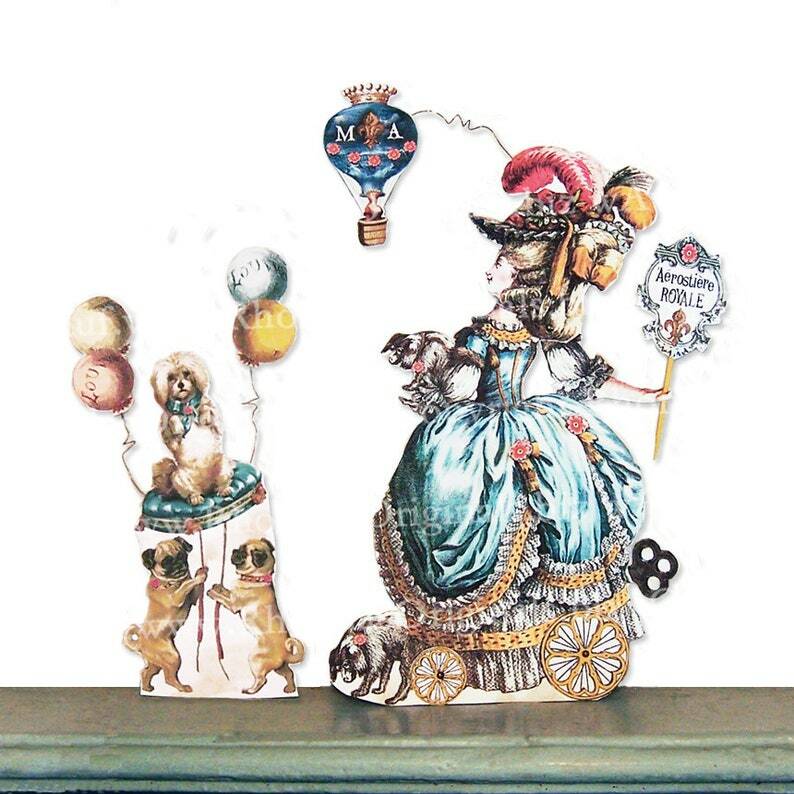 This Royal Balloonist digital download paper doll is one of the characters that makes up my Marie Antoinette French Paper Doll Parade. Simply print out in color using your inkjet printer, cut, assemble per my instructions, and stain the cardstock character with coffee to make it look like an actual antique! You can also use the vintage images in your papercraft and scrapbooking projects! This would make a memorable 3D greeting card that the recipient can use as home decor. All characters print two sides and stand on their own, so they can be used in the center of your table and enjoyed from all sides. They also look good running across a mantle. They can also be hanging decorations (instructions included). Collect them all! MA10 - Madame Angelique (meaning “angel” in French) is the Royal Balloonist. Some think she is full of hot air because she always wears skirts that billow out like the balloons she oversees. One thing is for sure, she takes very good care of Marie’s fleet. Arm moves on brad. Some parts dangle by wire. Wheels spin. BUYER NOTES: Digital downloads are not returnable. See my policies before purchasing. You will receive jpgs with pdf how to instructions. I own the copyrights. These digital files cannot be resold or shared with others. Send your friends here to purchase their own copies. You cannot sell printouts of the files either. You can print out the dolls, assemble them, and then sell the finished 3D product on a small scale. See my policies for more info.